More easily and efficiently make recommendations to your clients by inserting places directly into chats. Tap the search icon in the lower left of a chat thread, select places, add some color (optional), and send. A hot link is created for places in the chat so clients can directly link to the venue page - this also avoids mix ups on which place you're recommending. Adding places to chats this way also adds them to the index list - the charcoal bubble in the top right of a chat thread. 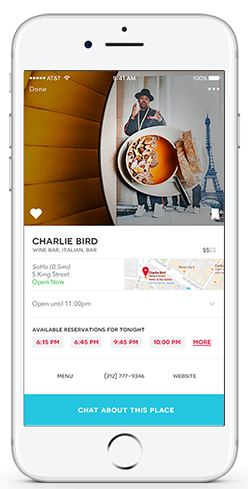 The sophisticated algorithms that get smarter to help you easily & efficiently recommend places in chats to your clients are a core feature of String. Favorite, Hit List or recommend a place, and that place shows higher in future search results. You're probably often recommending the same places to different clients, and this makes it easier to remember and recommend your preferred spots. From a venue page, simply tap this button to insert a place into a chat thread and to enable the algorithms to learn. Inserting places into chats creates an index for your clients. A link back to that chat thread is created in the venue page so they can reference what you said about a place. This will also be a valuable feature for getting former clients to re-engage when their Plans have expired - they'll see the links, and the chat, but they won't be able to chat with you until they repurchase a Plan.